SYRACUSE, N.Y. - It is public art made of private wishes. 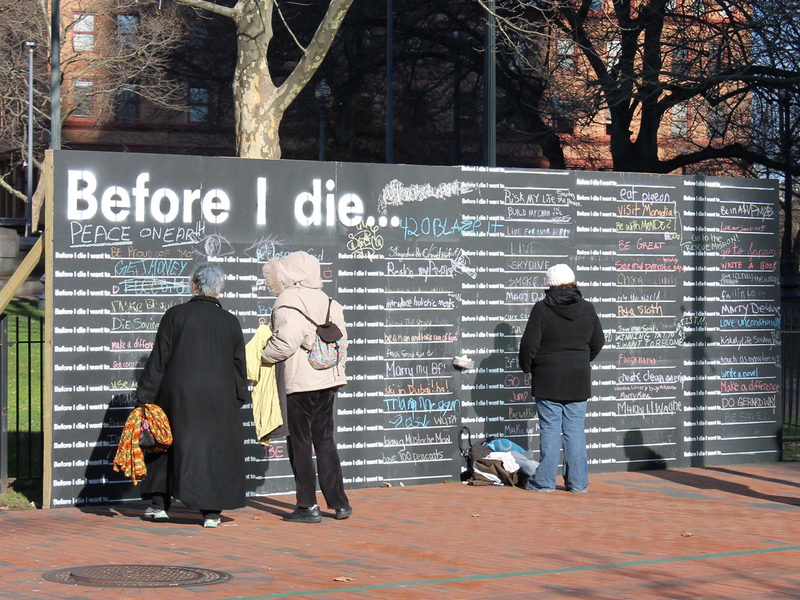 In a phenomenon spreading across the globe, oversized blackboards, painted on buildings and freestanding displays, invite passers-by to complete the sentence: "Before I die I want to ..."
Answers, some profound, some profane, are written on stenciled lines with pieces of sidewalk chalk picked from the ground below. "... make my dad proud." "... find the yin to my yang." Since artist Candy Chang created the first wall on an abandoned house in her New Orleans neighborhood in 2011, more than 400 walls have gone up in the United States and more than 60 other countries, including Kazakhstan, Mexico, Iraq, Haiti, South Korea and South Africa. "I've been surprised by how quickly people have dropped their guards and written sincere and sometimes heartbreaking things on these walls," said Chang, who said the first wall was inspired by the loss of a loved one. "It reassures me that I'm not alone as I try to make sense of my life." "... get my wife back." "... slow down for a moment and maybe even stop." "It's an honest mess of the longing, anxiety, joy, pain, gratitude, insecurity and wonder you find in every community. ... It's like collective therapy in public space," said Chang, responding to questions via email. Chang earned a master's degree in urban planning and sees in public spaces the potential to unify and communicate. Her own entries have ranged from "enjoy more places with the people I love" to "revive a ghost town." "I don't know if maybe you're more likely to do it because now it's out there for the world to see, there's just something magical about stuff like this," said Sara McAlister, 22, after stopping to write on a former factory building in Syracuse. "I think putting it out there, even considering the question, is going to make a difference." "Travel the world," ''brighten someone's day," wrote McAlister, a bartender who recently finished a master's degree in social work at Syracuse University. "And between you and me, I wrote, marry this one over here," she said, nodding toward her boyfriend, Patrick Kraushaar, 26, who was writing "inspire someone positively" and "make my family proud." "It's almost like positive imagery," Kraushaar said after putting his chalk down. "It helps bring it to fruition, maybe?" Building owner Rick Destito painted the "Before I Die" wall after seeing the idea on Facebook. "It's such a simple idea but it resonated so much with me because there are so many things that I want to do before I die," said Destito, who is transforming the former gear factory into artist and rehearsal studios. He has watched people of all ages and backgrounds stop and write, some lingering, others dashing off a hope and hurrying off. "... see a cure for autism." Nyquis Turner, 16, stopped to write, "play in the NFL." "Find a cure for cancer. Be famous," Lynn Morehouse read from one of two boards that went up last month in Providence, R.I. "Some of them are funny. Some of them are a little off the wall. ... I like it." "... tell my dad I'm gay." Chang said a universal theme is personal well-being, citing repeat entries like: "come to terms with who I am," ''have no regrets," ''forgive and be forgiven," ''heal." A hardcover book, "Before I Die," released earlier this month by St. Martin's Press, permanently captures some of the answers, which are often otherwise erased to make room for more. "Some walls reflect the current politics of the region," Chang said. "But for the most part, the walls have shown just how universal our hopes are. "We want to love and be loved," she said. "We want to see the world. We want to help others. We want to understand who we really are."